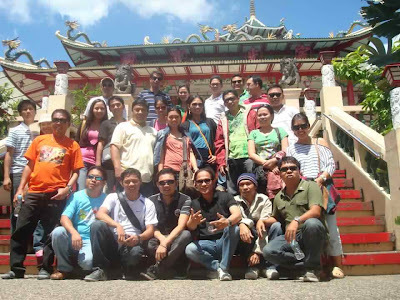 My professor from the MIT graduate school had required us for an educational tour in Cebu and Bohol. So, we were 24 in the trip and we sure had great time visiting tourist spots and tasted various native delicacies. One of the pride of Cebu is the great Taoist Temple and since we were not required to take pictures inside the temple, we could only make use of any opportune time for picture taking. The picture above was taken just a few steps from the temple and in spite of the noon heat, we sure had great smiles for a picture.